SAN DIEGO, CA. Teachers, students and their supporters gathered this morning in Balboa Park and marched to the California State Building in downtown San Diego in a protest against proposed education budget cuts. At around 9:30 Saturday morning, hundreds of people met at the intersection of Park Avenue and Presidential Way, then marched down Park to Broadway, then to Union Street where the State Building is located. For awhile, protesters carrying signs and placards decrying the cuts encircled the entire block, and then they massed at the front doors for a large rally with speakers. The 500-plus crowd chanted, “Save our schools, save our schools!” with the echoes bouncing off the nearby buildings in a mostly deserted downtown. At the last minute, police cordoned off Union Street in order for the crowd to fill the entire street in front of the building. 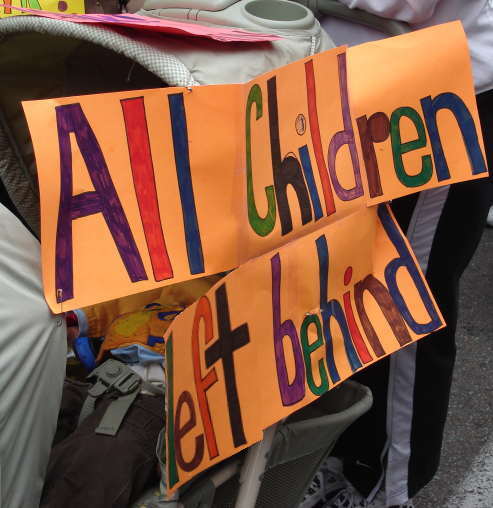 Impassioned Speakers deplored the proposed 10% across-the-board cuts to education by California’s governor, Arnold Schwarzenegger, calling on Sacramento to not balance the State’s budget on the backs of those who don’t have a voice – the school children. 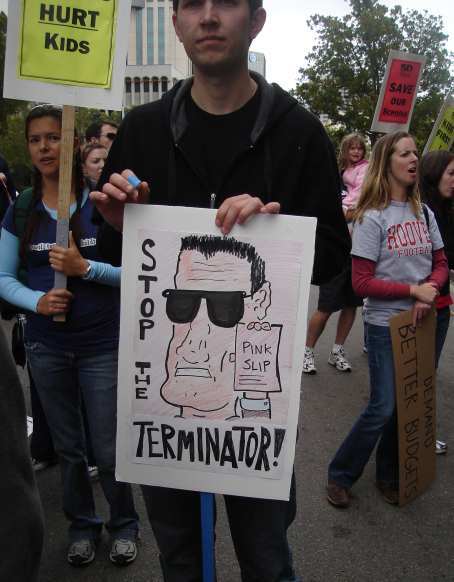 The one student speaker yelled out: “Governor Schwarzenegger – if you terminate education, we’ll terminate you!” – and the crowd responded with loud noise in favor. Passing cars and the occasional truck honked in support. — Another protest is planned for Tuesday, April 22nd at 5pm, at the San Diego Unified School District Headquarters – located at 4100 Normal Street. 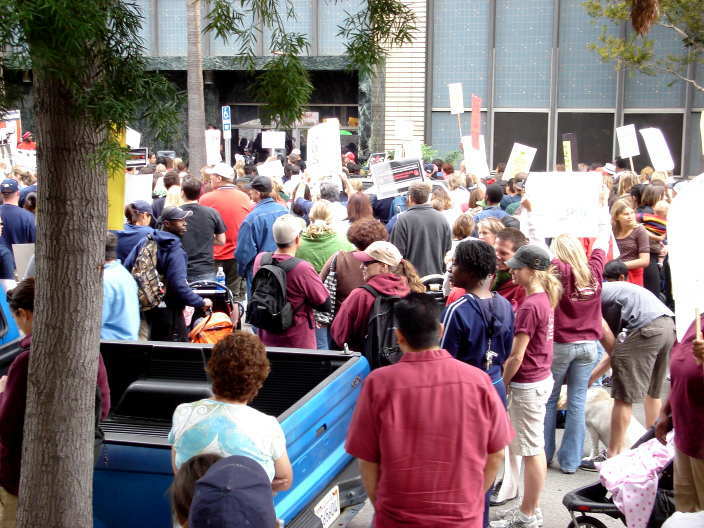 This demonstration is being planned by the San Diego Education Association and is focused solely on cuts to the City Unified District. People are asked to wear black to this protest. 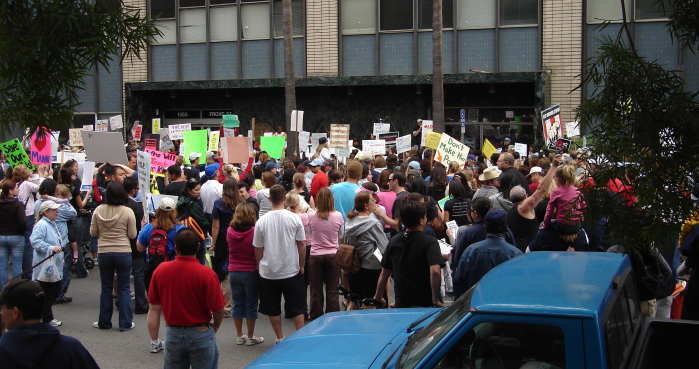 There was plenty of media on hand, as this is a popular issue – unlike – say, peace protests and the war in Iraq. The police were very cordial and easily blocked the street for the protesters, appearing to not be in a mood for hassling the demonstrators. Who knows – maybe the wife of one of the cops was in the crowd. There were lots of good signs, but not one connected the education cuts to the war in Iraq. And I didn’t see any of the traditional peace protesters there in support of the teachers and schools. 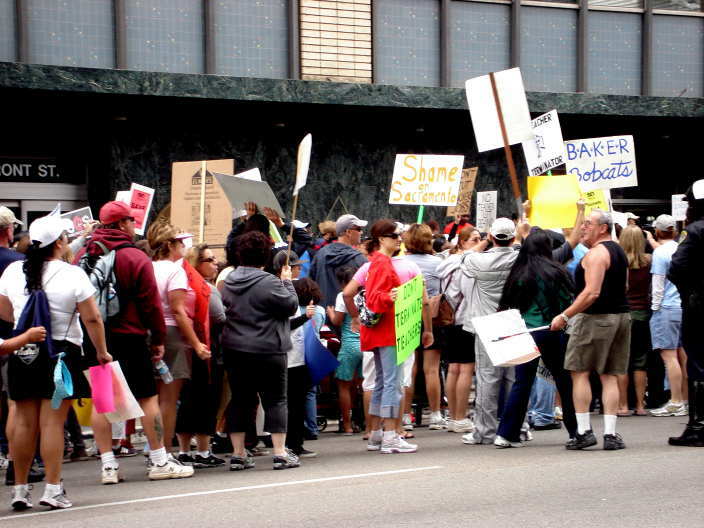 Yet over-all the demonstration was a tremendous show of support for those resisting the governor’s cuts. Good fotos (was that patty who took them?) and good job. Yeah Joe, I took the photos and the video. Thanks for the plug! What happened to this movement today. I want a shirt. This spending cap, 1A is HORRIBLE! Herb Zimmer – did you want an OB Rag T-shirt? If so, email us at obragblog@gmail.com or simply go to the sidebar and follow directions to order/ use paypal. No…. 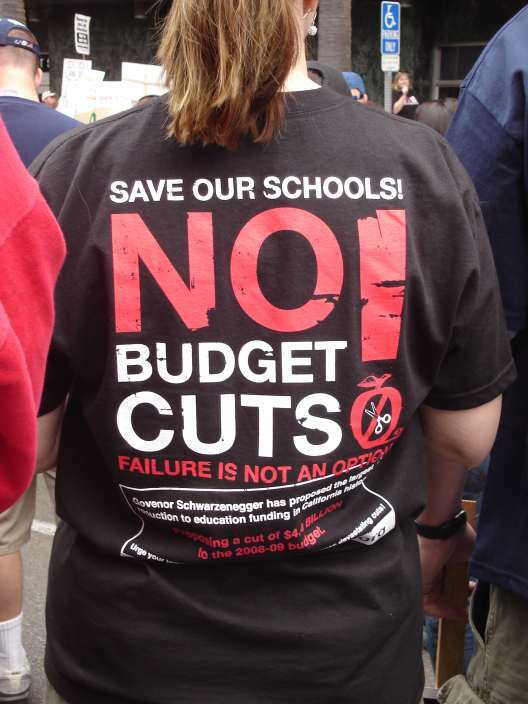 I was looking for the save our schools Arnold shirt in the photos. The savesdschools.com website disapeared. Did the top paragraph in this article get smaller to make room for a bigger picture? If I remember correctly a longer list of supporters was in that first paragraph along with a link to a support or the T-shirt web page? Maybe I’m getting old! Hi Herb, the layout of this page probably is a bit different than it was back in April. We changed our format some and it did affect some older posts, but we haven’t edited the content in any way. Seriously?! My comment from April 17 of this year refers to the old savesdschools.com link for the T-shirts I was looking for. If I search the page for this link it only shows up in my comment above (and now in this new comment). I realize links go bad but usually the old references remain. I’m positive they were a supporter and darn sure this was the first place I heard of SOS and the only place I ever found a picture of the Govenor(sic) shirt. Alzheimers?! Hiya Herb, maybe we removed the reference to the bad link but I don’t remember now… Alzheimers… you’re probably right! The picture and first paragraph has moved again! No worries, I found other coverage of this same story at socialistworker.org. They still have the SEIU/ACORN groups listes as supporters for this same protest story. Never been to that site before, but I was at least finally able to prove to dozens of angry local school PTA doubters that my temporary amnesia is gone on remembering our contact with these groups.